A Dickey’s franchise owner claims that the franchisor is hiding franchise failures by reselling and reopening failed locations over and over to a stream of new owners… a technique known as franchise churning. (UnhappyFranchisee.Com) Franchise churning is a predatory franchise practice used by disreputable franchisors to create the appearance of success despite losses and franchise failures suffered by its franchisees. Generating new franchise fees, transfer fees and store opening fees from a succession of new owners can also be a franchisor’s motivation for churning. It works like this: When a franchise location fails, the franchisor tries to find another buyer to take over the franchise location as quickly as possible, often at a reduced price. The failed franchisee generally gets nothing in the deal, and the franchisor may generate new franchise fees, a referral fee, store opening fee or other revenue. The franchisor generally (in our experience) makes no effort to determine or correct the reason for the initial failure, and to the public it just looks like a temporary closure. If and when the second owner and subsequent owners fail, the franchisor just resells the location to new franchisees for new franchise fees. With franchise churning, a chain could boast that it had no or very few stores closed, because its many franchise failures are simply recorded as “transfers,” not as closures. A given location might look highly successful because it’s been open for 5 years when really 4 or 5 owners have lost their investments along the way. We received a franchisee complaint alleging that the fast-growing Dickey’s Barbecue Pit franchise chain is engaged in churning its locations. 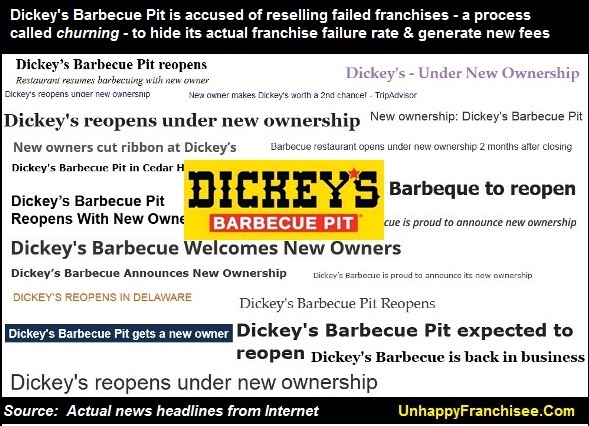 We investigated and, while we can’t definitively support the allegations, we did seem to find an abnormally large number of franchise transfers and news stories of Dickey’s locations closing and reopening with new owners. Are you familiar with the Dickey’s Barbecue Pit franchise? What do you think? Share a comment – positive or negative – below. Is Dickey’s Hiding Franchise Failures by Reselling Failed Stores? Our Dickey’s franchisee whistleblower states that, rather than closing failed or failing franchises, Dickey’s tries to keep them limping along until they find new franchise owners to buy them. I was also told that for locations that can’t stay open anymore, the family will waive royalties, calling it “royalty relief” until they can find someone to assume your store (for free) so that they don’t have a high store closure rate. The failed franchisees reward for this is that they don’t have to pay them the $800,000 they threaten to sue you for. The $800,000 Dickey’s franchisee refers to comes from a “liquidated damages” clause in Dickey’s franchise agreement stating that if a franchisee closes a store before its 20 year term is up, the franchisee owes Dickey’s all the royalties and fees they would have paid if they remained open for the rest of the term. This unrealistic and draconian fee, the franchisee claims, is simply used as a bludgeon, a threat that can be lifted if the failed franchisee does not interfere with the churning process. An analysis of Dickey’s past Franchise Disclosure Document (FDDs) shows how transferring struggling or failing locations to new franchise owners can obscure the true nature of failed franchises. Between 2012 – 2014, there were a total of 430 Dickey’s franchise locations open. Of those, only 24 locations were terminated, reacquired by the franchisor or ceased operation for other reasons, giving the appearance of a 6% franchisee turnover rate. However, if you go by the number of franchise agreements (including transfers), there were 518 franchises under contract during that time, including 88 transfers to new owners. That would indicate that 112 franchisees exited the system (through termination, reacquisition, ceased operation or transfer) indicating a higher turnover rate of 22%. Another indicator of franchise failures is the 2015 The Coleman Report, which publishes the default rates of franchisees who financed their franchises with Small Business Administration (SBA) guaranteed loans. According to the 2015 Franchise Coleman Report, 8 Dickey’s SBA 504 loans were approved between 2005 – 2014 and $5,083,000 was disbursed. So far 1 of the 8 (13%) has repaid in full and 3 (38%) Dickey’s franchisees defaulted on their SBA loans. According to the 2015 Franchise Coleman Report, 128 Dickey’s SBA 7(a) loans were approved between 2005 – 2014 and $35,793,800 was disbursed. So far 18 (14%) of the 128 have repaid in full and 12 (9%) Dickey’s franchisees defaulted on their SBA loans. ARE YOU FAMILIAR WITH THE DICKEY’S BARBECUE PIT FRANCHISE OPPORTUNITY? SHARE A COMMENT BELOW. ← Are DICKEY’S BARBECUE PIT Franchise Owners Being Exploited? I am the former owner of a Dickey’s Franchise. Was the most expensive business education I ever encountered. Still $160K in debt due to their inept “development staff”. Sold it back to Dickey’s to keep from getting sued (a nice little scare tactic). They already have a new owner. Not sure if he had to pay the full franchise fee again. But I cashed in 2 retirement accounts to help fund this endeavor that was doomed to fail from the get go. They sell you by telling you all this support and help you get from the corporate office, only to get snubbed when things are doing south. Their development staff pressured us into making a hasty location decision….one I am still paying for. They have ridiculous timelines for their staff so they can make “goal”, while not providing accurate information that leads you to some bad decision making. I could go on and on. DO NOT BUY THIS FRANCHISE! Email me if you want further info. Do you mind telling us what went wrong at your location? High rent or bad supplies or no advertising? There no one thing that ruins a franchise. He had the right to pick the location and construct how he wanted. He decided to let someone else decide for him and now he’s blaming them. They lead him to make a bad decision.